Founded back in 1998, we are now one of the largest clubs in Northampton. Since 2014 we have held the prestigious FA Charter Standard Community Club Award. We offer both boys and girls the chance to play football, from our Under 7 youngsters all the way through to adult football. "We Only Do Positive" is the new initiative aimed at improving behaviour on the sidelines of youth football. So, if you’d like to join a professionally run club like ours contact us for more information. 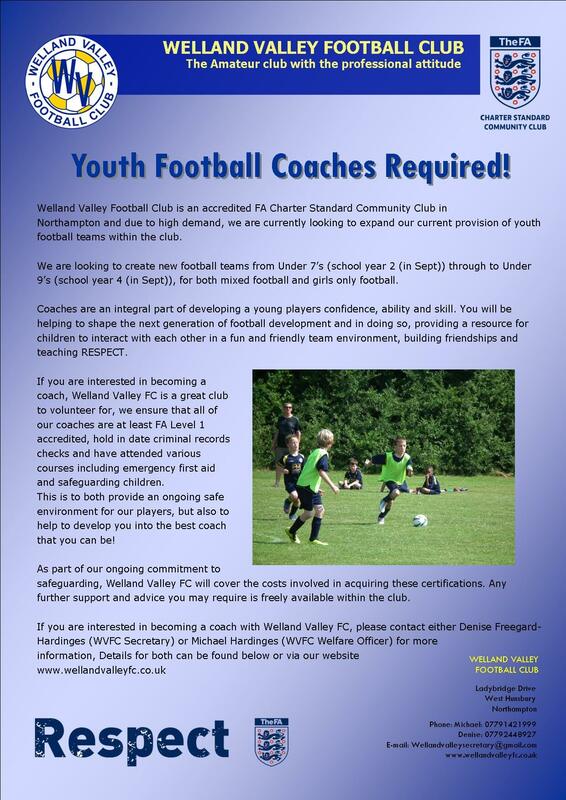 The Official website of Welland Valley Football Club. Founded back in 1998, we have since grown into what is now one of the largest grassroots football clubs in Northampton. In 2009 we were awarded the FA Charter Standard Club Status and since 2014 we have been awarded the highest level of FA accreditation- The FA Charter Standard Community Club award. We offer both boys and girls the chance to play football in either mixed or female only teams, from our Under 7 youngsters all the way through to Under 16s. All our teams currently play in either the Northampton & District Youth Alliance League (NDYAL) or the Northamptonshire Womens and Girls Football league (NWAGFL). In addition to competitive youth football there are also non-competitive opportunities within mini-soccer. Welland Valley Football Club is proud to have been sponsored by Harrison Murray estate agents since 1998 and we look forward to a long future of a perfect partnership.